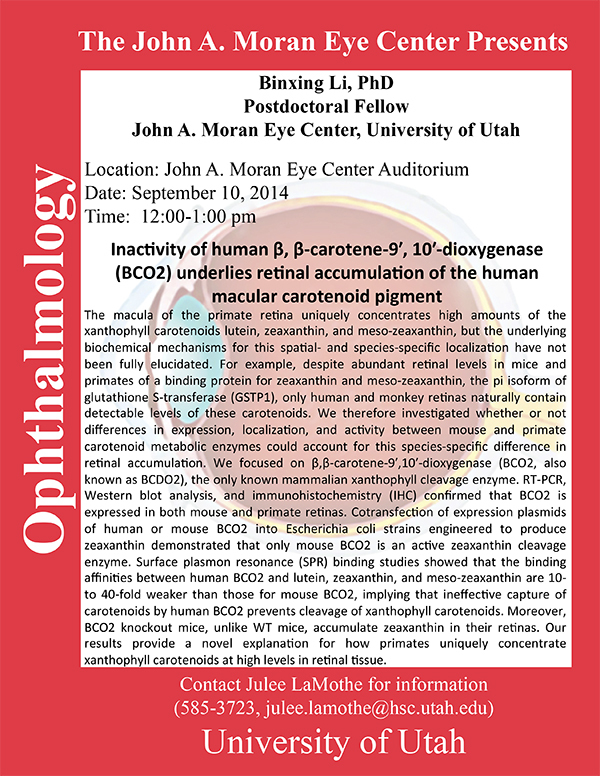 Binxing Li, post-doc in Paul Bernstein’s lab will present a seminar at noon on Wednesday, September 10th in the Moran Eye Center auditorium on Inactivity of human β, β-carotene-9ʹ′, 10ʹ′-dioxygenase (BCO2) underlies retinal accumulation of the human macular carotenoid pigment. Abstract: The macula of the primate retina uniquely concentrates high amounts of the xanthophyll carotenoids lutein, zeaxanthin, and meso-zeaxanthin, but the underlying biochemical mechanisms for this spatial- and species-specific localization have not been fully elucidated. 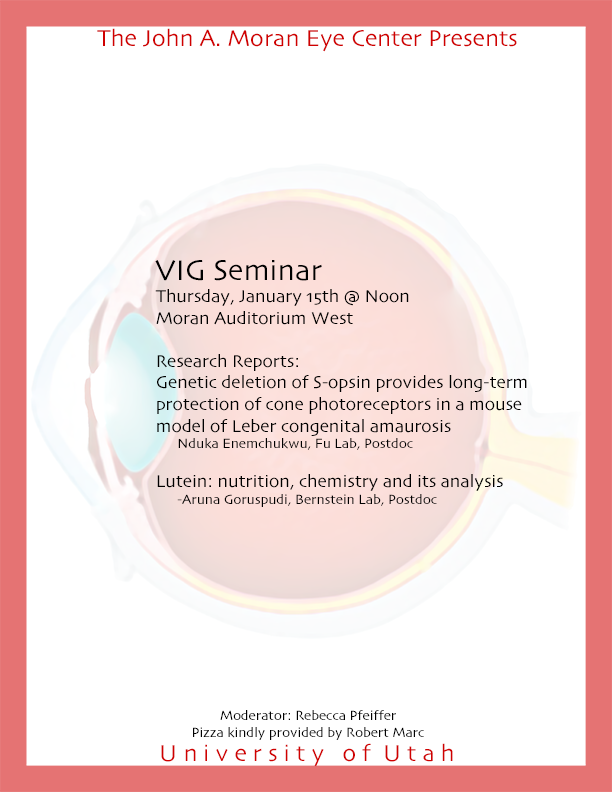 For example, despite abundant retinal levels in mice and primates of a binding protein for zeaxanthin and meso-zeaxanthin, the pi isoform of glutathione S-transferase (GSTP1), only human and monkey retinas naturally contain detectable levels of these carotenoids. We therefore investigated whether or not differences in expression, localization, and activity between mouse and primate carotenoid metabolic enzymes could account for this species-specific difference in re0nal accumulation. We focused on β,β-carotene-9ʹ′,10ʹ′-dioxygenase (BCO2, also known as BCDO2), the only known mammalian xanthophyll cleavage enzyme. RT-PCR, Western blot analysis, and immunohistochemistry (IHC) confirmed that BCO2 is expressed in both mouse and primate retinas. Cotransfection of expression plasmids of human or mouse BCO2 into Escherichia coli strains engineered to produce zeaxanthin demonstrated that only mouse BCO2 is an ac0ve zeaxanthin cleavage enzyme. Surface plasmon resonance (SPR) binding studies showed that the binding affinities between human BCO2 and lutein, zeaxanthin, and meso-zeaxanthin are 10- to 40-fold weaker than those for mouse BCO2, implying that ineffective capture of carotenoids by human BCO2 prevents cleavage of xanthophyll carotenoids. Moreover, BCO2 knockout mice, unlike WT mice, accumulate zeaxanthin in their retinas. Our results provide a novel explanation for how primates uniquely concentrate xanthophyll carotenoids at high levels in retinal tissue.